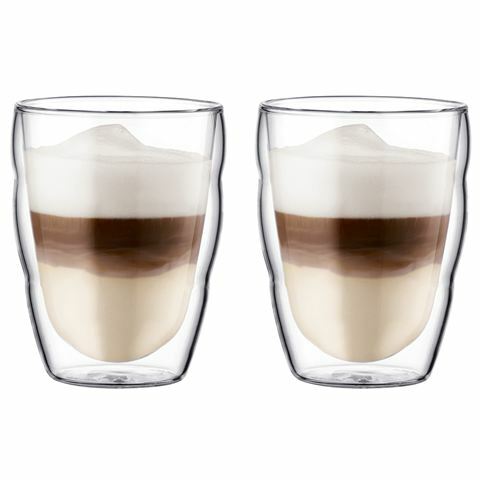 It doesn’t matter which you prefer – Bodum’s Pilatus glasses can deal with either! Its intriguing double-walled design serves two functions – firstly, it looks seriously cool, and secondly, the two walls insulate your drink, keeping it hot – or cold – for much, much longer than a normal glass. And because it’s made from durable borosilicate glass, it’s capable of dealing with anything. The Pilatus design also features a unique curved exterior which moulds perfectly to your hand as you hold it. So now your hands are safe from high temperatures and fit seamlessly around the glass. Plus, this clever double-walled design incorporates an intelligent almost invisible silicone plug on the base which regulates air pressure between the two layers. Made from durable borosilicate glass with a silicone plug on the base. Presented as a set of two glasses.